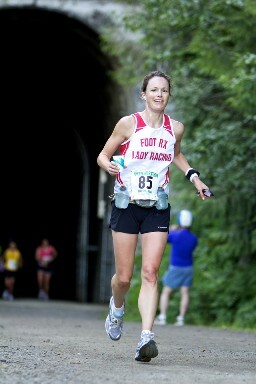 The Light at the End of the Tunnel Marathon is all that and more. In fact, what began as a search for a summer marathon would become lucky number seven for me. When I discovered the race in North Bend WA, I became instantly intrigued. Its coarse runs straight through two miles of unlit railroad tunnel. But the marathon was just one of the highlights of a "most excellent adventure". Before the marathon, my husband Mark and I decided to explore downtown Seattle in order to adjust to the time difference. Our home base was the Green Tortoise, a hostel directly across from the iconic city market which houses a plethora of fresh fruit, fish, and vibrant cut flowers. We were also in walking distance of the waterfront, ferries, shopping, renowned restaurants, and the cultural public square. We were nervous about our first stay in a hostel but now wouldn't trade the experience for a five star hotel. As our guide and new friend Sasha would say, "It's all about community". Another employee, Nigel, took Mark and I on a bike ride to Alki Beach on the Puget Sound after he got off work. We also enjoyed the company of Roman from France, Rob from London, Anita from Italy, and many other traveling souls from across the globe. Together we explored some of Seattle's finest highlights, nightlife, and culture. Mark and I also found time alone, including a canoe adventure on the Puget Sound that, in spite of a life harrowing storm, was quite lovely. After we left Seattle we explored the Olympic National Park which just happens to be the setting for Stephanie Myer's Twilight series. I was surprised when Mark (not a vampire fan) mentioned Forks WA. Once I saw the emerald ferns expanding up and out beneath the moss laden trees towering in the HOH Rainforest and the glacial fed waters of Sol Duc falls I was mesmerized and understood Mark's ulterior motives. I worried a little about unfamiliar hikes days before a marathon but I was drawn by the forest cathedral. Of course we paid homage to Twilight including the iconic stops in Port Angeles and Forks. In fact, the shore at La Push was rejuvenating and I found solace in the lapping waves. The next day we relished the relaxing drive back thru the park to Seattle and then on to North Bend. After checking in at one of the local motels, we made the short trip to Snoqualmie Falls. They were so magnificent, we just sat back and lavished in its mist. On the return we stopped to partake of a local festival in North Bend before retiring for the typical sleepless night before a marathon. A strange thing happened that night as eight hours of undisturbed sleep seized me. In the morning Mark took the opportunity to volunteer which he truly embraced. I joined the ranks of the intrepid and boarded the long yellow school bus that would rally us to the start. The talk was optimistic despite the fact that in a town that could count the total number of hours above 80 degrees this summer the forecast called for the mid 80's. The bus winded its way through the pass and we soon arrived at Hyak Station. A short time later we were off. The ground was firm and yet forgiving as it led us quickly to the marathons name sake. A blast of cool moist air struck our skin as we entered the dark tunnel and we were met head on with the condensed vapors of our own breaths. The flashlights came on as our Garmins went out. I failed to consider the loss of technology in the womb of the earth's walls. Never the less, I found myself enjoying the break from the tech tie and bound myself to the runners around me and the promise of the light at the end of the tunnel. Liane in the light at the end of the tunnel. As we hit the warm golden rays of sun and our eyes adjusted, we were greeted by volunteers collecting flashlights and providing water. The race was on and perhaps a little too fast at an 8:20 pace. Even after slowing down the miles seemed to pass by quickly. Abundant wild flowers, fearless rock climbers, imposing trees and ancient snow capped peaks saturated my senses. Before I knew it, mile fifteen had slipped by. Previously my wall, mile fifteen was barely a notion as my legs felt strong fueled by a season of multisport. The unmanned water stations were undaunting as I took in deep breaths of the mountain air while refilling my bottles. And then there was the last 10K. Every marathoner must know how it feels to hit that last 10K with an empty tank. The change in forces is not subtle but rather hits you like a Mack truck. Thank heavens today there are no well meaning and yet misguided fans yelling out "It's just a 10K left". During those last six miles anything can and will go through your head. At times I felt like Charlie Sheens character from Platoon who feels Elias and Barnes are fighting for possession of his soul. Like Saturday morning cartoon characters, a devil and angel were sitting on either side of my shoulders fighting for control of my will. Thoughts of Mark and my children who have sacrificed for me to be here buoy my march. I take in deep breaths to send oxygen to the pain in my knees. I remember my mother who came to spend the week with my children….Dr. Robbins who seems truly excited for me despite the aches and pains I darken his door with….Skip who supported me for my first marathon and introduced me to the ways of the Penguin…..Allison, Jamie and Jenna who keep telling me to go for it, they know I can do it…..My Sherpas Shannon, Mark and Marlee who were always up for a bike ride when it was time for my distance runs…..Coach Chris who never seems to tire of his passion for swimming….Michelle, Jonelle, Andy, Warren, and Abbey who have all joined me over the past few years on the last 20 mile prep runs ….My grandparents who loved unconditionally….My best friend from childhood, Heather, who I lost to a motorcycle accident…..They are all with me, stride for stride, willing me forward. The pain in my hip becomes overwhelming until I remember it's supposed to hurt. It's just doing what it has trained to do for the last 16 weeks. Then walking seems like a fine idea. After all, I was passed by a guy around mile 4 using the Jeff Galloway method. He's probably finished by now. But wait, that's not how I trained. I'm closer than I've ever been and maybe the closest I will ever be. I'll be dammed if I miss it by walking now. Lead seems to have engulfed by legs but I do not stop. I won't. And then like a mirage in the desert I see it…the fabulous finish. This time I lack the strength to raise my arms but I think I have it. This would be my light at the end of the tunnel. After soaking my legs in another glacial fed river and downing a few bananas, Mark introduces me to Terry Sentinella. A fellow volunteer, Terry just finished the Bad Water 135 mile race through the desert. Unbelievable. After showering at and checking out of our room we found our way to Rainer National Park via the Chinook Bypass. The Naches Tavern, a colorful joint popular with bikers, proved a good stop for all that ailed me. Afterwards we hiked in the snow above Sun Rise Point for incredible views of Mt. Rainer's summit. On many days the view is elusive but today it is a picturesque reward. Our days end found us at the Whistling Jack Lodge, an old family owned establishment that echoed of an era past. The final moments of a perfect day were swallowed by beer and pizza on the brick patio overlooking the Naches River. We continued our pilgrimage the next day through Mt. Rainer with a hike through Patriarch Grove which is home to 1000+ year old Cedars and Douglas Firs. We literally became tree huggers as the girth of the trees beckoned our embrace. Down the road we were met by curtains of fog that obscured our views from the Paradise area. Undeterred we made one last hike to Carter Falls before leaving the park. The remainder of our sojourn was spent back with our new friends at the Green Tortoise in Seattle. Even with all we were able to see and do we just scratched the surface. This may not be every ones idea of a dream vacation but… If you like running on Virginias Creeper Trail…..If you like culture, music and outstanding food….If you like interesting and friendly people…..If you love nature and all that it has to offer…..The Light at the End of the Tunnel Marathon is for you.